Does your family have some recipes that they have just come to expect at family events? The dish that, when the person who usually makes it arrives at the gathering, you hug and say hello, but reeeeally you’re checking their hands to make sure they brought it? Share those dishes in the comments! It’s so fun to see friends’ family traditions. 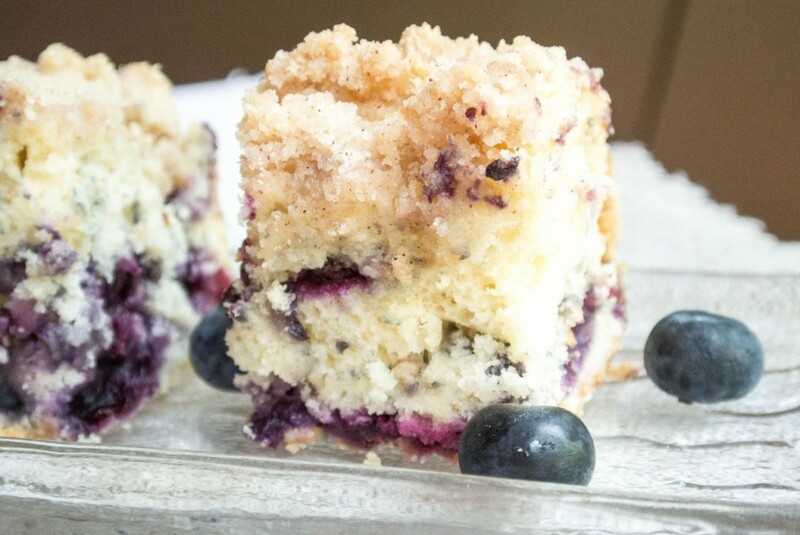 This Blueberry Coffee Cake is one of those dishes in my family. Truth be told, I didn’t grow up liking blueberries (wasted time – wasted! 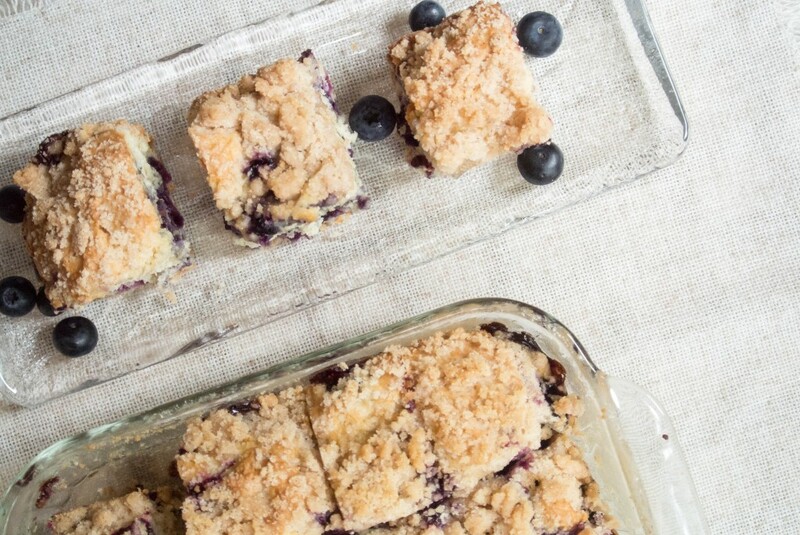 ), but as I have come to my senses, this recipe is settling in as a fan favorite. And it’s so easy. All ingredients you probably have on-hand, and no fancy techniques. 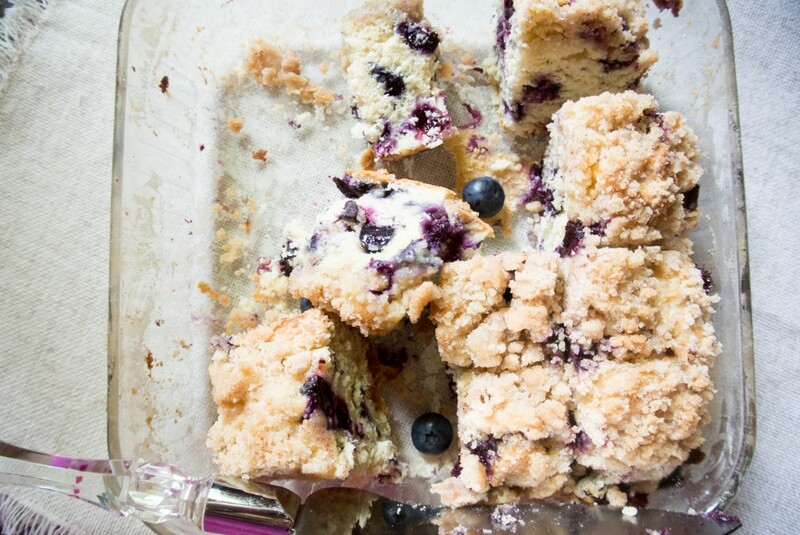 Just delicious, fluffy coffee cake, studded with tart blueberries (you can use fresh or frozen), and covered in a sizable layer of cinnamon-sugar crumb topping. When Ga handed over her recipe file to me, this was one that she highlighted as an obvious delight that I had to carry on. I took this task very seriously, as you can see! You know how usually when you make a coffee cake, you have to double the streusel topping because there is never enough? Not so with this recipe. The quantity in the recipe is just right. And you’re talking to the girl who used to ONLY eat the crumb topping off of Entenmann’s Crumb Donuts (brought to our home, of course, by Ga). 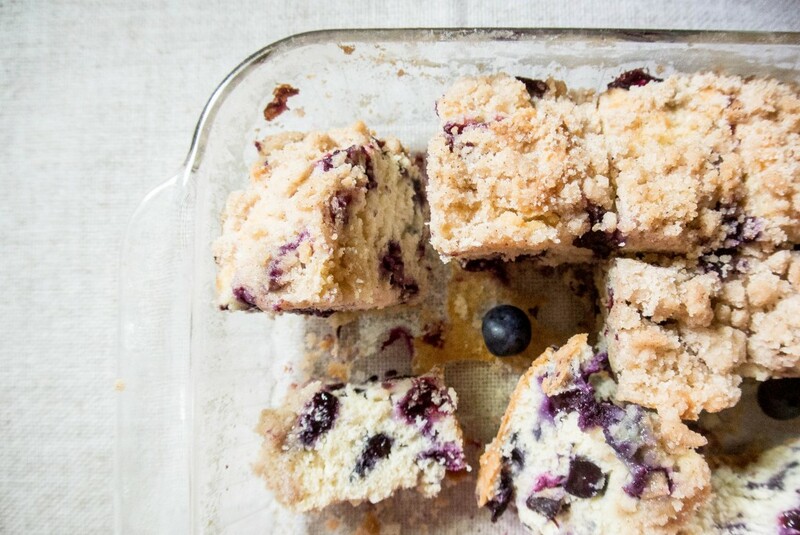 Try serving this coffee cake with brunch. Mix the batter before you get everything else ready – like an easy but option-filled Baked Benedict Buffet with a fruit salad – and everything will be done at the same time. 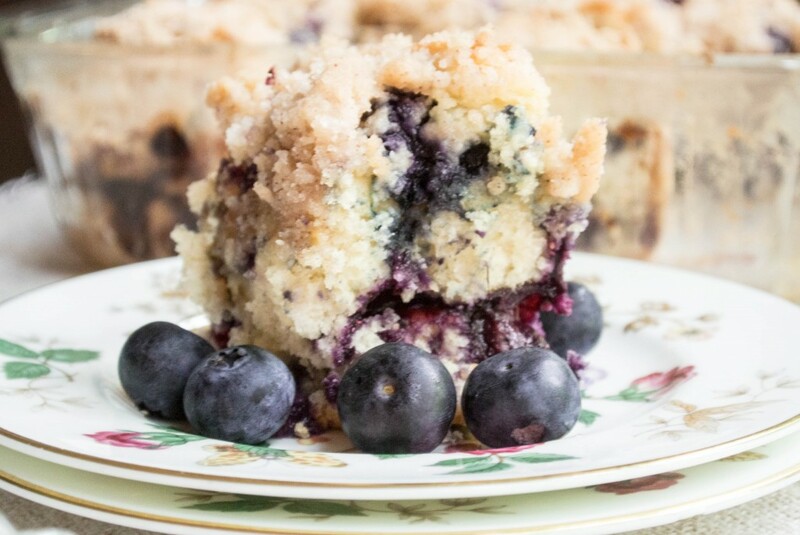 Just pop the eggs for the benedicts in when you lower the temp on this Blueberry Coffee Cake! 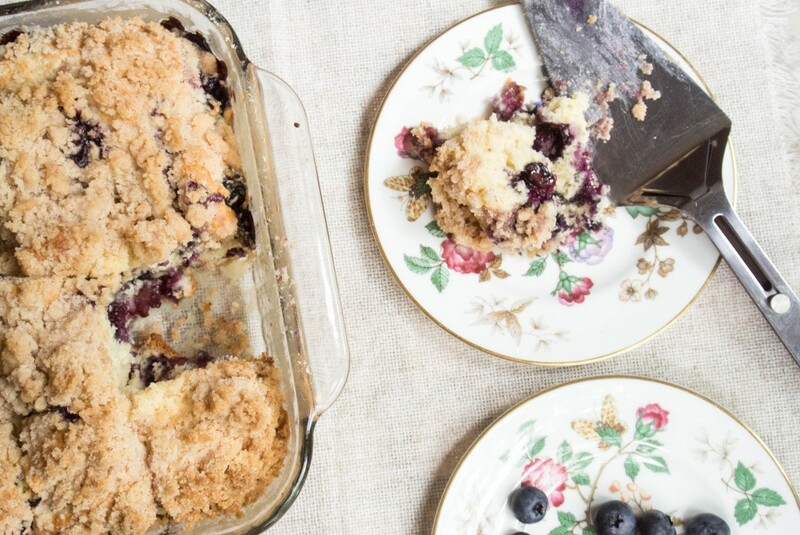 Of course, you could always bake the cake during brunch, but as we all know, one of the specific, delineated purposes of brunch is to be able to eat dessert during a meal. 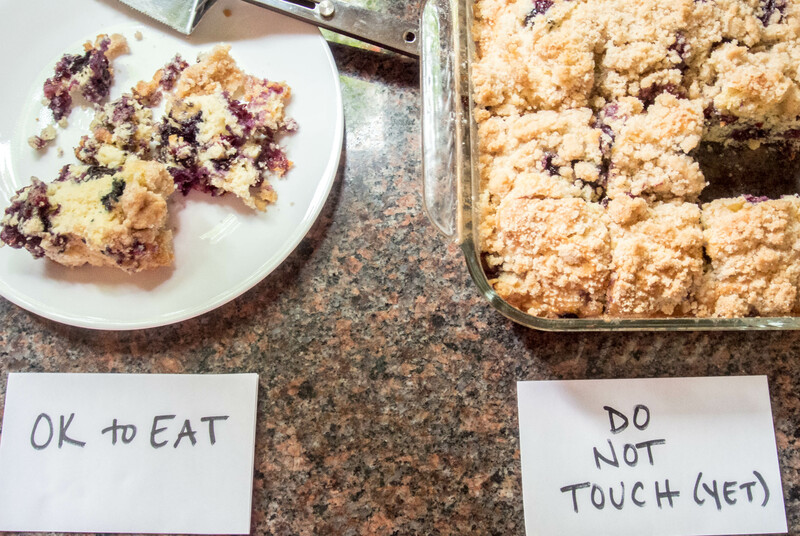 And of course, if you are like my family, you can store the leftovers in the 8″ x 8″ pan you baked it in, covered in foil, in the “snack corner” of the kitchen, with a knife in the pan for easy access. I promise it won’t be there for long. 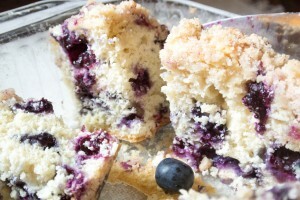 The blueberries in this batch were HUGE, and left great crevasses when they baked down. 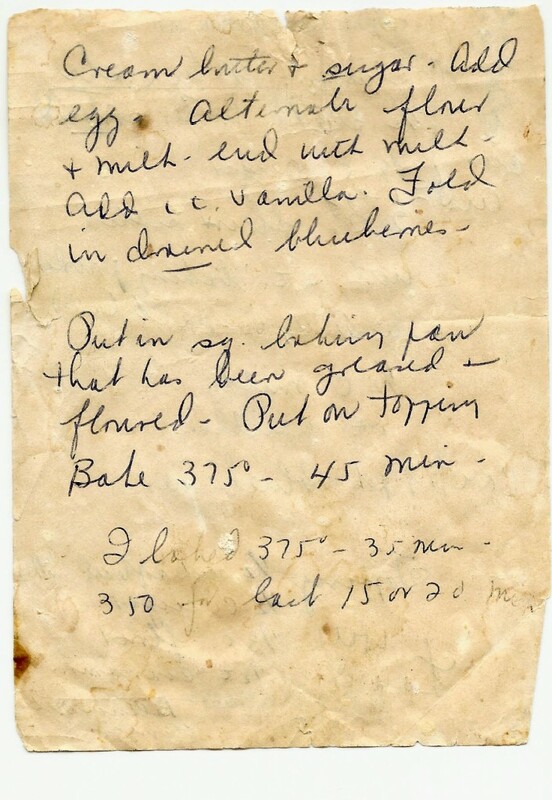 I love original hand-written recipes, and there are many in Ga’s recipe file. 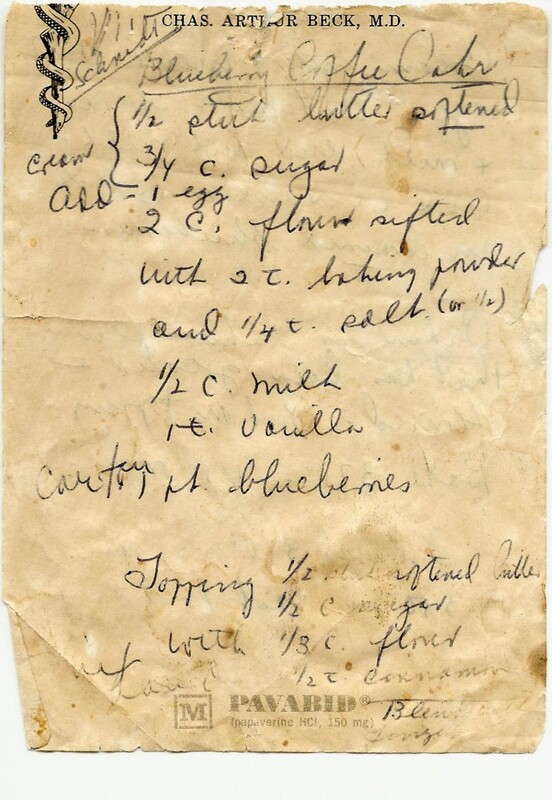 They sometimes take a minute to decipher, but you can’t beat a time-aged recipe with food stains, jotted down on my grandpa’s scratch paper (apparently provided by a drug company selling Pavabid – most office supplies in my grandpa’s home originated from drug companies). And in the upper left corner, we have Vi Schmidt to thank for the recipe. I don’t think I met Vi, but she contributed something to my family that brought smiles to faces for decades, and continues to do so. Using a hand mixer or stand mixer, beat the butter and sugar until creamed together. Add the egg, and mix again. Sift in half of the flour, adding the baking powder and salt to the sifter. Mix well. Add half the milk, and mix again. Sift in the remaining flour. Finish off the milk and add the vanilla, and - you know what to do - mix again. Stir in the blueberries. If any liquid has formed from frozen berries, drain and discard. This is the fun part! Grab a set of little hands if you have a kid available. Place the four ingredients in a medium bowl. Using your fingers, combine and smush them all together, pinching as you go. Make little pieces, and make sure all the dry ingredients are incorporated into the butter. Prepare an 8" x 8" baking dish (tin, glass, or casserole) by greasing it with the butter left on the wrapper from the stick you just used in the recipe. Lightly dust the pan with flour (use the sifter if you want), and knock out the excess into the garbage. Pour in the batter, using a spatula or spoon to get it into the corners. Top with the topping! And don't be shy. And get it in the corners. Bake at 375 for 35 minutes. Then lower the temperature to 350, and bake for another 15-20 minutes. 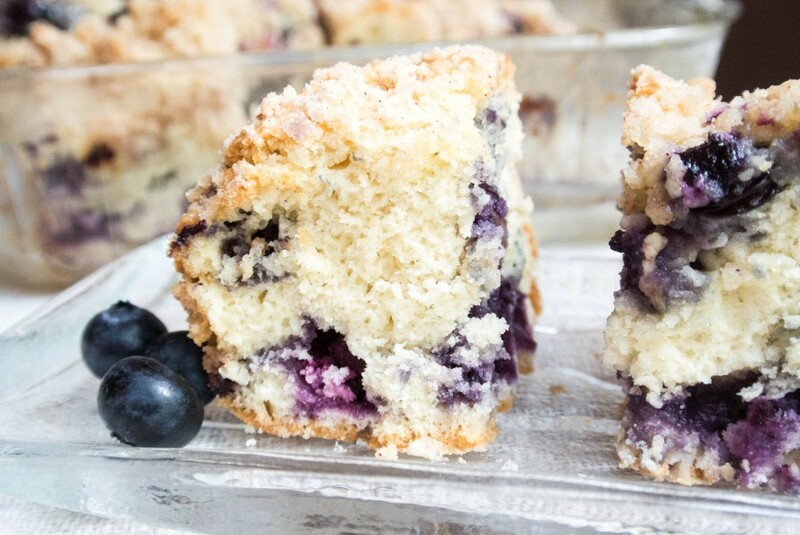 The coffee cake will get a great rise, and the topping will very lightly brown. Upon completion of photography, all was devoured. The cake was too dry, even with the blueberries. I think I’ll try 3/4 cup of milk and/or cooking it at 350 for the entire length rather than starting at 375 and lowering the temperature to 350. I am so sorry to hear that, I haven’t heard that before! I haven’t tried it with more milk, so I can’t speak to if that would make it moister, but cooking at 350 should be fine! Loved it! Family has requested this to be made every Sunday. Sounds like a fun tradition to me! Enjoy, Jennifer! The instructions state to bake for up to 55 minutes (35 min at 375 and then 15-20 more at 350). My guess is you just needed 5-10 minutes more. You can place a piece of foil over the top (just lay it on) if the top is getting too brown. Yum! A lovely texture and not too sweet. I had a fridge full of blueberries and tossed in an extra cup for a blueberry Nirvana. Thanks for the note, Timothy, and the encouragement for frozen berries! DELICIOUS!! I added another tsp of vanilla and used whole milk. Thank you for sharing!! We loved it! Hi Becky! Thanks for sharing your family recipe. I would like to add this to our Christmas brunch I host. Can it be prepared the night before, and baked the next day? Hi! You’re welcome! I have never tried that, but I don’t see a reason why you couldn’t. Give it a try! Maybe put the topping in a separate bowl in the fridge overnight and sprinkle in the morning so it doesn’t sink in. Let me know how it goes – Merry Christmas! My favorite breakfast recipe so far. I have just recently gotten in to baking and this will remain on the top of my list. Ps my phone wouldn’t input on the five stars for some reason. It is definitely five star worthy. Thank you so much, Randy! I’m glad you love it and am excited for your baking beginnings! Have you thought about trying these Butterscotch Granola Blondies next? http://www.myutensilcrock.com/2013/11/08/butterscotch-granola-blondies/ Highly recommended. I will throw in a 5-Star for you, I am sorry about the technical glitch! Could I substitute skim milk with whole milk? Thanks! I haven’t tried, but I’m sure you can! Let me know how it goes! I tried it this morning and it went totally fine! Going to try this recipe this weekend! I was wondering for the topping if you always use sugar or if you ever sub out brown sugar. Most recipes I’ve found call for brown sugar so I just wanted to check! I hadn’t thought about it, but yes the batter is a bit thick. Let me know how it turned out! I’m glad it looks *perfect* and *beautiful*! Do you think this could be easily doubled? Looks delish, but I was hoping to make it for a bigger crowd. I have never tried to double it, but I bet it would work out fine. If possible, I would use fresh blueberries, because 4 cups of frozen blueberries might produce a lot of liquid. Just a thought! Let me know how it goes if you try it. Sometimes when I am nervous to double a recipe, I just make the smaller batch twice. This is such a quick mix that it wouldn’t be a hassle. 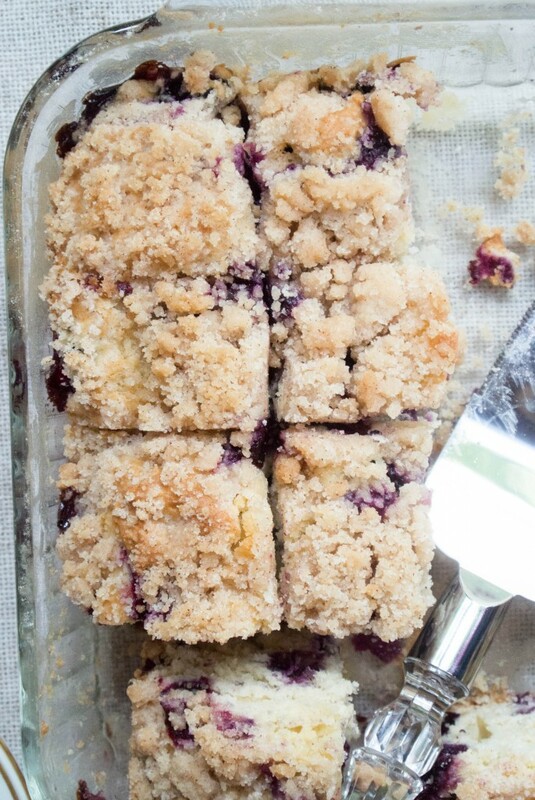 You could make the double crumble all at once, too, reducing prep time. I hope you love it as much as my family and I (and now my co-workers) do! I read your comment to my family during Thanksgiving dinner tonight and it completely warmed our hearts. We were missing my grandma, while enjoying a few of her standards (stuffing and meringue cookies). Your comment was just what we needed. Thank you for the sweet comment. I hope you and yours had a wonderful Thanksgiving. We did have a wonderful, relaxing Thanksgiving. Thank you. My daughter requests coffee cake, rather than muffins, so I made this for her. But we all loved it.